People can academically appreciate the fact that every electric motor in the world works because of magnetism. One can reflect on the fact that every transformer uses it, too. CRT monitors, TVs, brushless DC motors, power meters, modern welding gear and engine ignition timing systems, various vending machines and umpteen other gadgets use permanent magnets. And electromagnetism has a hand somewhere in making practically every other electronic device work. To get a true, visceral appreciation for magnetism, though, you can't beat playing with magnets. Really terrifyingly freakin' strong magnets, by preference. When I was a kid, I had a bag full of black ferrite magnets of various shapes and sizes. They were fine toys. I could not hurt myself with them. I've grown up now. Well, physically at least. And so I've graduated to these. "These", in this case, are neodymium iron boron (NIB) magnets. They're commonly just referred to as "neodymium" or "rare earth" magnets, and this composition is both more powerful and cheaper than the previous king of the permanent magnet world, samarium cobalt. Well, the smallest magnets in the above picture are little gold-plated cylinders only 6.4 by 2.3mm in size. The field extending from these magnets doesn't reach far with any strength, because the smaller a magnet of a given intrinsic strength is, the smaller will be the volume of space it can fill with a magnetic field of a given strength. Magnetic field strength drops off as the inverse cube of the distance from the magnet, too; get twice as far away and the field strength drops by a factor of about eight. So two of these little tackers barely notice each other over a distance of more than an inch. But just tossing one of these tiny 'uns in the vague vicinity of another will cause them to click together end-to-end. And they do it strongly enough that I can hold the one on the end of a full stick of 12 of 'em and twirl the rest around as fast as I can, without them letting go. The strongest magnets in this collection, if you ignore the large-surface-area but thin and fragile hard drive magnets (of which more in a moment), are the 18.25mm-diameter spheres. 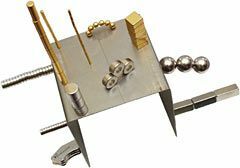 Spherical magnets, mercifully, tend to push your fingers out of the way as they head for each other, so these ones aren't too prone to pinching people. But they can certainly do it, and playing with them without letting them smack together so hard that they damage themselves is easier said than done. These magnets are all covered with protective metal plating, but careless play will flake it off quite quickly, and the NIB material itself is quite fragile. This collection of magnets is three "grab bags" worth, from ForceField, who seem to be pretty much the only really serious sellers of a proper range of cheap surplus rare earth magnets on the Internet at the moment. They're still not dirt cheap, mind you. I bought three $US20 grab bags on Ebay, and got 81 magnets as a result; they'd all easily fit inside a cigarette packet, if not for the fact that they'd roll it up into a ball if you tried. But it's a respectable collection, nonetheless. There's an assortment of rods, discs, rectangular prisms and spheres, and there are only three of the usual flat-banana-shaped surplus hard drive magnets. Those magnets are massively strong, just like any other neodymium, but their odd shape makes them unusually fragile. Magnets of more Euclidean-solid shape are more useful. The ForceField grab bags seem to be the cheapest way to get hold of these things, short of getting old dead hard drives for free and ripping them to bits. But you can do that, too. I'll show you how in a moment.